Find the hottest 2019 prom tuxedos and suits in a variety of looks, modern styles and color combinations at Bonaventure Tuxedo. Come and explore the best prom tuxedo rental ideas and get expert style advice and inspiration at our convenient Mineola location where you can browse all the latest styles and trends, from slim fit suits, classic suits, and tuxedos. Express yourself with confidence this 2019 Prom season with a prom tuxedo or prom suit rental from Bonaventure Tuxedo, one of Long Island’s leading tuxedo rental stores. The tradition of prom is part of our American culture and as such you should dress it up right, turn heads and make that entrance you deserve. Make the memory of a lifetime at your next prom with a rented tux from Bonaventure Tuxedo. When does your tuxedo fitting matter? All the time but most importantly in those photos you will always have, (or at least your mother will) and out on the dance floor. Dress to impress this 2019 prom season with a Tuxedo rental from Bonaventure Tuxedo because it’s a great way to look amazing for a night without breaking the bank. We have your perfect fit, style and brand, without the need to purchase for a lifetime. We want you to be confident in your tuxedo rental this prom which is why we carry the most popular designer names so you will look good no matter what designer you pick! Running short on time? These are our top picks for prom tuxedos 2019. These are updated, modern versions of the most classic and traditional tuxedo styles. 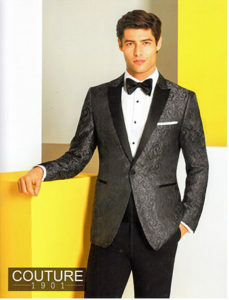 At Bonaventure Tuxedo we understand that finding a perfect tuxedo for prom can be a hassle. That’s why we make it simple. Contact Bonaventure Tuxedo today for all your prom tuxedos 2019 needs.